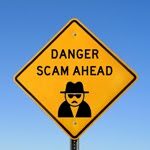 A few weeks ago, in Patent Spam and Other Scams, we wrote (amongst other things) about the growing prevalence of "unauthorised register" scams. As a reminder, operators of these scams monitor public databases for newly-published applications, and then send an official-looking letter offering to register the applications on an unofficial database – for a substantial fee, of course! Many of these scams may be technically legal, assuming that the operators do indeed provide the unofficial registration service, because although the letters typically look like invoices, they usually include a description of their actual purpose and effect somewhere in the "fine print". At the time, we noted that many of the letters include logos remarkably similar to the old WIPO insignia, and we speculated that it would not be long before they would begin to adapt to the new logo. Unfortunately, though unsurprisingly, it turns out that we were right. WIPO recently added a couple of new examples to its scam warning page, for organisations calling themselves the "World Intellectual Property Database" (WIPD) and the "Register of International Patents and Trademarks" (RIPT, ironically as in "RIPT off," perhaps). The World Intellectual Property Database registration form includes a logo that is a clear imitation of WIPO's logo and tag-line "Encouraging Creativity and Innovation", as the comparison below illustrates. Indeed, we would have thought that this is a fairly clear case of trade mark infringement. We wonder whether WIPO practices what it preaches, and has registered its trade marks? We once again caution all of our readers not to be fooled by these scams!